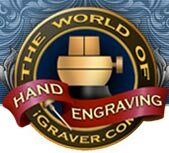 Share information with hundreds of hand engravers around the world, and it's free! Fast and fun to cut! Another one for jewelry, but works on other items too. It's quick to cut and sparkles like crazy. A great border for jewelry or other applications. Add interest and beauty to your work by shading in different ways. Liven up your borders with this little beauty. It's not difficult once you learn these easy steps. A border that's been around forever, yet still popular with engravers (and customers). Here are some tips to show you how this classic is engraved. What do you get when you cross a retired medical reseracher with a generous engraver who's out to study and document the many ways of computer transfers? Download Waldemar Schimdt's PDF and find out! Follow along on a 25-photo tutorial of engraving a signet ring. They're challenging, exasperating, require a different approach than what you may be used to, and they'll make you a better engraver. 16 photo tutorial: Make beautiful raised gold designs in a fraction of the time of a conventional inlay. Award winning goldsmith Mike Cirelli's step-by-step photo tutorial of making gold wire from scratch. An extremely cool hobo nickel by Bob Finlay. Learn one of Rex's stippled background treatments in gun engraving. It's not a question of if, but a question of when. Learn what causes slips and how to repair them. Create beautiful shaded lettering with your stippling tool. Faster ain't always better, folks! Gold wire too thin for the channel you cut? Not to worry! This tip can be a real timesaver. Sources for many of the hard-to-find items used by engravers. Not free, but close to it, and boy do they cut! Perfect for restoration projects or the classic look of hammer & chisel engraving. Have something for sale or trade? List it on iGraver's new Classified Ads pages. What? You don't have a website? Not to worry! Find out how easy it is to have a nice looking and VERY inexpensive site to host your photos, bio, contact info, and more. See some of my student's work. Learn to manipulate and improve photos of your work. Darken your engraving for high contrast. It's not as flattering as you might think. Use the handy link button on your website. We've all made them, and here's what to look out for. Don't throw away those worn diamond laps! Use them for even faster graver sharpening. Line depth can be critically important when two cuts intersect. Find out why. Straight lines and borders are very unforgiving. Learn to cut 'em straight with this handy tip.